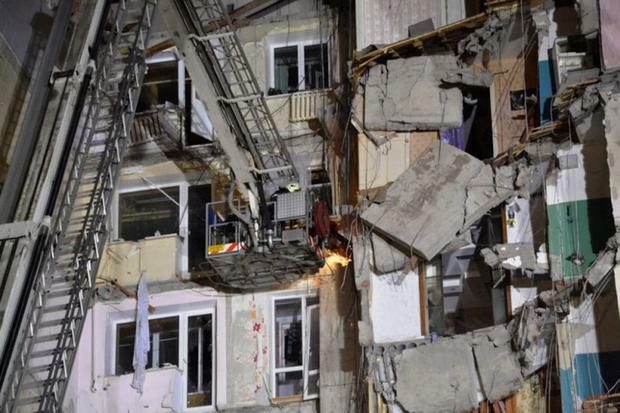 Rescuers work at the site of a partially collapsed apartment block in Magnitogorsk, Russia in this handout photo released by Russian Emergencies Ministry January 2, 2019. Russian officials have ended the search of a collapsed apartment building, with rescue crews finding 39 victims and one survivor in the three-and-a-half days since part of the structure came down while residents slept. Officials think an explosion triggered by a gas leak caused the pre-dawn collapse on Monday in the city of Magnitogorsk. A 10-month-old boy was the only person found alive in the wreckage. The baby suffered frostbite from lying in the rubble for 35 hours – temperatures were as low as minus 20C. The number of deaths stood at four for most of the first day, but climbed quickly after two nights of winter weather. Russian authorities acknowledged from the start that the extreme cold gave rescue crews less time to reach trapped survivors. Hopes rose when the injured infant was extracted from the debris on Tuesday. He was flown to a Moscow children’s hospital for treatment and was listed in a stable condition on Thursday. State news channel Rossiya-24 cited doctors saying the child had injuries indicative of “crush syndrome” – major shock and kidney malfunction characteristic of people trapped under heavy objects. No other people were found in the debris, although a cat was discovered alive on Wednesday. On Thursday, the mayor of Magnitogorsk told journalists there was no connection between the explosion at the apartment building and the fiery explosion of a minibus on the same street a day later. The vehicle explosion took place about 2.5 kilometres (1.5 miles) from the apartment block. Police said the minibus was carrying gas canisters but have given few other details.